The Olympics may be over, but you can still use them as inspiration until next time! I won’t lie, I’m not too into sport. But then, every four years, the Olympics rolls around, and suddenly I wish I was athletic. Every time I see someone my age (and sometimes younger, which is even more painful) winning a medal, I feel this irrational pang of jealousy. Now that Rio 2016 is over, and I’ve had time to catch up on all the medal-winning I missed – the time difference meant I was asleep while most of the action was happening, which again furthers my point of feeling inadequate – I thought I’d get involved in the Olympics in the only way I ever will: through clothes. So, if you’re like me and will probably never win a gold medal, you can still get involved in the fun (hopefully as much as Gisele did in my new favorite GIF) through fashion! Gymnastics is one of my favorite sports to watch (we’ll get to my favorite later), and as a fashion fan, I love the interesting uniforms they wear. This year, I particularly liked Argentina’s Ailen Valente’s leotard. 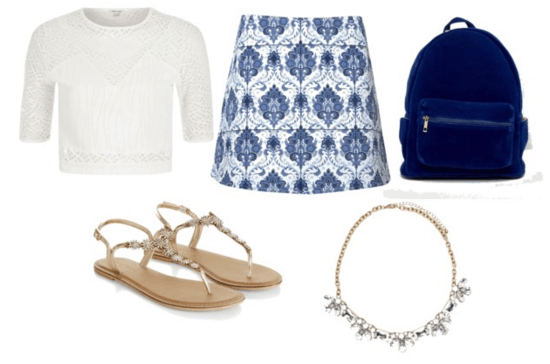 Since a blue gradient bedazzled one piece with a sheer top may be a bit too much of a look for campus, I went with this cute patterned skirt and a white top with sheer detail, and the sandals and the necklace are both super sparkly, like Ailen’s outfit. 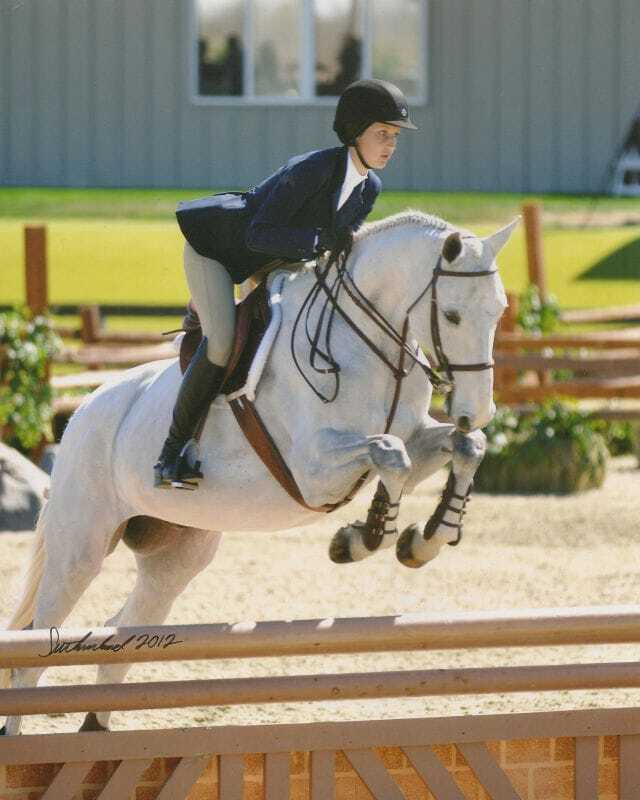 Equestrian style outfits are nothing new – it’s a trend that resurfaces frequently. So, for that reason, I tried to stay away from the military-style jacket and leggings type look and go for something a little bit different, but still sticking with the overall feel. 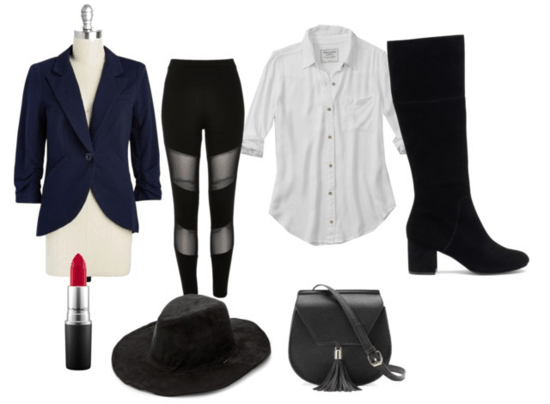 I love the sheer detail on these leggings, and paired with a white shirt, blazer and these gorgeous knee-high boots, this look is stylish yet still has that Equestrian vibe. Instead of a helmet, add a cute hat (this one makes me really wish I looked good in hats), and this fringed bag that reminded me of a horse’s tail. I’m all about the details, guys. Synchronized swimming is my favorite Olympic event. Buzzfeed called it the “catwalk of the Olympics,” so of course it deserves a mention here. While there’s controversy about how made up the women need to be, I personally enjoy the pageantry, as unnecessary as I can admit it is. Spain’s Ona Carbonell and Gemma Mengual wore these amazing black white and red embellished swimsuits, and although sequins may be a bit impractical for the beach, you can use them as inspiration for your next night out. This sequin bodysuit is basically a swimsuit, right? And these burgundy jeans are wet look, because swimming, and as I said, I’m all about the detail. Add an embellished clutch, some heels, and some gold hair accessories and you’re ready to flamenco the night away! Did you watch the Olympics? What was your favorite event? Do you do any sports? Do you like these outfits? Which is your favorite? Let me know in the comments!